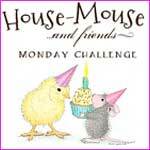 Hos Dorte: Challenge E-F-G at ABC Christmas Challenge. You can play along with one of the themes but also with all or combine them. My card is E for Edge. always cute and easy to combine with my favourite colours, blue and white. But for todays card I've tried some new colours, red and green! And I must say I love the way it turned out. The shape on the lover edge is made with a die from Tim Holtz. and the paper with the dots is embossed with a Cuttlebug embossing folder. lovely prize to a lucky random winner. A set of Sizzix Dies. What a cute card Dorte, and like you I have a weakness for snowmen. I love how you coloured this sweetie and the little bird feeder he is holding. 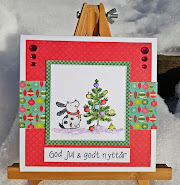 A sweet Christmascard with a cute beautiful coloured image Dorte. What a sweet card! Thanks for joining us at Tuesday Throwdown! Thanks for sharing your lovely card with us for the ‘No Man like a Snowman’ Challenge. Hope you can join us again. A fabulous Christmas card Dorte, such a fun snowman.